The USB 3.0 specification was introduced as a prototype to the world in 2007 and is expected to be released to the public by Intel and its partners in 2008. USB 3.0 peripherals are expected to hit the market in 2009 or 2010. There is an increasing number of devices that could potentially take advantage of the additional bandwidth provided by USB 3.0. This includes especially external hard drives, flash readers, and video cameras. What is the USB 3.0 data-transfer speed? Intel and a few other companies are working on the USB 3.0 standard which should deliver more than ten times the speed of the existing USB 2.0 standard (480MBit/s). The USB 3.0, also called a SuperSpeed USB (USB 3.0) allows data transfer rates up to 4.8 Gbit/s (600 MB/s). Such high bandwidth is accomplished in the USB 3.0 standard by including fiber optic link in addition to traditional copper (or gold-plated) connectors. The USB3_RX and USB3_TX in the picture below shows the fiber optic links. The picture below shows the fiber optic links in action. The USB 3.0 target transfer rate of 4.8 Gbit/s puts USB 3.0 ahead of current eSATA which allows transfer rates up to 3 Gbit/s. Yes, it is. USB 3.0 is backwards compatible with USB 2.0. USB 2.0 is backwards-compatible with the first USB 1.1 definition. Are there any problems with USB 3.0? One problem with a USB in general is that when you are transferring data, it uses up quite a lot of your CPU horsepower. This is becoming less of an issue with improvements in processors; however, devices capable of using USB 3.0's higher bandwidth capabilities could make CPU usage a problem again. Another problem is the optical cable. If you bend the cable that goes from your computer to your camera, it is not a big deal because data can be transferred through a cable regardless of how much intermingled it is unless it is broken somewhere. The situation is different with an fiber optic cable. Fiber optics needs to be fairly straight, and there are limitations on how long the cable can be. It is expected that USB 3.0 will support max cable length of 2 meters (or 6 feet). Transferring 600 MB/s with USB 3.0 via fiber optics requires significantly more energy than a pure electric wire line with USB 2.0. How do I know my device is USB 3.0? Is there any alternative to USB 3.0? If you are running out of USB bandwidth and do not have the ability to acquire USB 3.0, your next option is to go with a USB 2.0 PCI card which will give you another 480Mbit/s pipe. A USB card composes of a USB host controller and several USB ports that allow you to install a wide range of USB peripherals. USB cards come in two favors: USB PCI card and USB PCMCIA cards. USB PCI cards are designed solely for desktop computers. USB PCMCIA cards (shown above) are intended for laptops. What is behind the USB in my laptop? 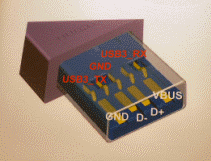 You can read more about USB at the previous page: USB: Universal Serial Bus. The next page talks about an interesting topic: Blade servers.